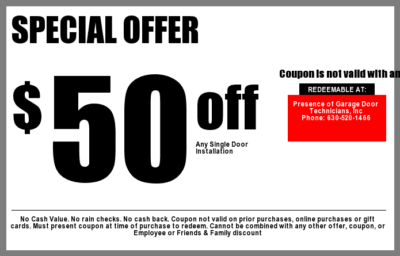 Whether you live in Aurora IL, Naperville IL or Plainfield IL, we offer great deals for our customers. Save with our garage door coupons and discounts. Each coupons is valid for one time. There is no expiration date on them at this time. 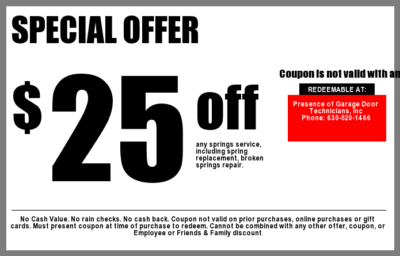 You can only use one coupon at the time for our services. In order to claim your discount, please have your coupon printed and ready. Once the technician reaches your house, please provide the coupon first before starting your project. To learn more about Garage Doors repairs and garage door installation, Openers repairs and installation, Torsion Spring replacements, visit our services. For general information on our business, visit our homepage, Garage Door Technicians, Inc. Call us today at (630) 520-1466 to make your appointment.